Back in August, 31 American Special Operations troops were killed when the Taliban shot down their helicopter in Afghanistan. It was the deadliest incident for the U.S. military in the ten-year war there. Of the dead, 22 were Navy SEALs from the now-famous Seal Team Six, which was responsible for the killing of Osama bin Laden. The team aboard the Chinook helicopter was operating as backup in the Tangi Valley, just west of the Afghan capital of Kabul, when the chopper was hit by a rocket-propelled grenade. When the remains of the dead were flown back to Dover Air Force Base in Delaware, President Obama joined with the families who long ago learned to live with the fear their loved ones might not come home. Knowing the dangers of a soldier's job is one thing, but nothing can prepare the families for the loss. One family member who lost a loved one in that attack told CBS News, "We mourn -- more than anything else -- his life of unfulfilled dreams." But now, one woman is trying to make a difference for those families. 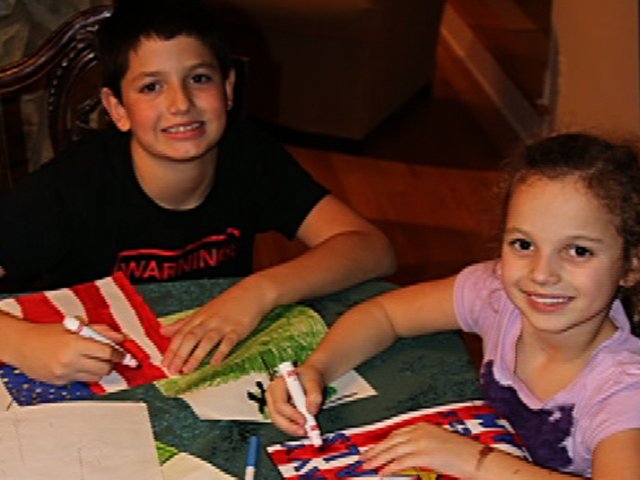 Suzanne Vogel, the wife of a former Navy special warfare member and a mother of five, started a grassroots community group called NSW Kids, which raises money for the naval Special Warfare Foundation through the sale of a patriotic sticker created by her children. Following the August attack, Vogel said, the entire tightly-knit Navy family was heartbroken. So, to help empower her kids to help the families affected by the attack, they began drawing and made some stickers to sell. "They gave all of their allowance money and we went to a parking lot (and sold the stickers) and it took off from there," Vogel said on "The Early Show." The effort began with $96 from Vogel's son Hunter, $92 from her daughter Alexandra, and $140 from Vogel herself. The effort, so far, has raised more than $10,000. "People contact us from all over and we, send them stickers. We accept donations for the Navy SEAL Foundation, whose sole purpose is help the widows and the children. Football teams have worn them on their helmets. And it's just been a blessing to be a part of it." She added that the stickers helped her children cope with the loss, saying, "I think this is how you get a military child through what a military child has to go through. I think it's also a way for people to be invested in America and to know that these guys are doing it for them. So I wanted to encourage the families of the SEALs and the other special warfare members, as well as give the kids a sense that they belong and they are doing it for them." The effort has gotten particular attention from NASCAR racer Josh Richards, who met Vogel and her family in the parking lot where they were selling the stickers. He and his sponsor Joy Mining Machinery, decided to help with the effort and eventually, one of the stickers drawn by Vogel's kids was placed on his car to promote the project.